M. Night Shyamalan gained a reputation after the huge success of The Sixth Sense for being the master of the sudden and unexpected twist. I remember seeing Unbreakable after absolutely loving and being blown away by The Sixth Sense. It seemed so contrived and over-the-top, and I felt annoyed with it. But, teaching Media Studies many years later, I was looking for something to pair with The Dark Knight, and decided to give Unbreakable a go. There were some similarities; connections with comic book heroes and the struggle of a man with the challenges of his life. 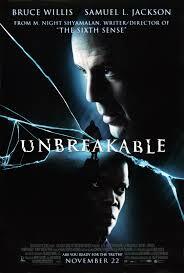 Unbreakable follows David Dunn (Bruce Willis), a man who is the only survivor of train collision. In the days after he leaves the hospital, he is contacted several times by Elijah Price (Samuel L. Jackson), a man who was born with Type 1 osteogenesis imperfecta, an extremely rare disease that causes his bones to break very easily. Elijah believes that Dunn is the opposite of him, a man who is unbreakable. A man who is destined to be a real life superhero. Watching it again, I found that is an extremely well-crafted film. Somehow, despite being a very strange and unbelievable premise, it felt very real. Still, there was absolutely something that I did not like about it. I think it is that the way the film is put together it is very obvious that the director wanted me to experience certain emotions at certain times. I expect that this is the case of most films, or at least most dramas. Yet, if it is so obvious that I am expected to feel this way, I feel like I have been tricked. I do like the film, however I do feel that I was being tricked into responses that, in turn, I rejected.